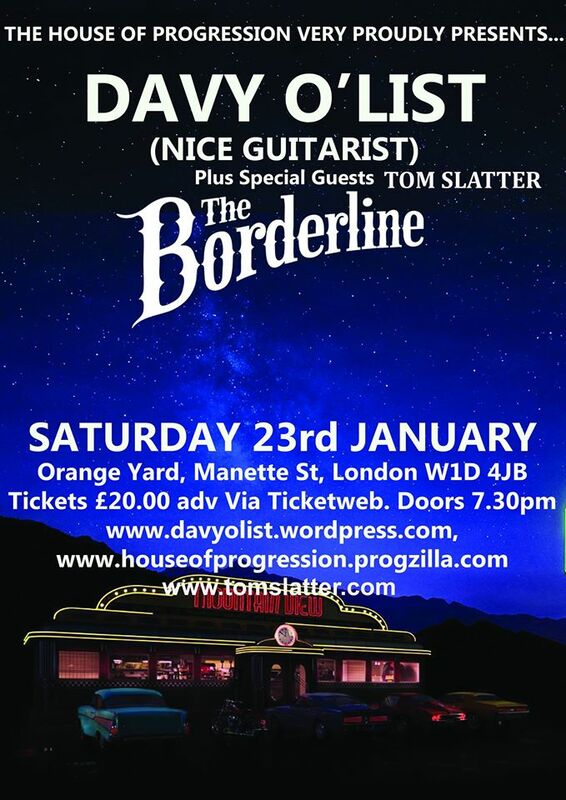 I’ll be supporting Davy O’List of The Nice fame on Saturday 23rd at the borderline. You can get tickets here. This January I will have been a ‘signed’ artist for about a year. Have you seen my new helicopter? No, that’s right, I don’t have one. Signing with Bad Elephant music is one of the best things I’ve ever done. It means my music is getting heard by more people at better quality than it did before. There’s a myth that if we could return the music industry to how things were a few decades ago, all problems would be solved for artists. Back then record companies had money to invest and they’d support new artists to develop an audience. That was true, but only for a minority of artists in some genres. It was like winning the lottery. Now there’s another myth: the money has dried up, labels don’t support artists, you might as well go it alone. That’s not necessarily true either, though going it alone is more possible now than previously. Getting signed to a good label is as difficult as it ever was, and no the big boys with loads of money aren’t going anywhere near new acts. They want a guaranteed income. But the little guys, the companies that do it for love not money are still there. Getting signed doesn’t mean huge advances and everyone doing the work for you. It does mean small, but meaningful financial and logistical support and, if both parties are sensible, realistic expectations of returns. Cos you’re not getting rich making original music. That’s not a thing any more, and for most it never was. There was no champagne when we signed, no illegal substances being snorted off other people’s anatomy, no media scrum, or dodgy offices. There was curry with a bloke called Dave. Bad Elephant Music has got some good press and you could be forgiven for thinking that they’re a big fish in the relatively small pond of progressive rock music (though much of their output isn’t what you’d call ‘classic’ progressive rock). But it’s still at the stage where no-one involves takes a wage and things are done for love not money. Hopefully in a few year’s time things can be done for love AND money, but those days are a while away yet. Then again, being a signed artist did lead to my first appearance in a print magazine, so I guess it isn’t completely lacking in glamour. My mum was impressed with that. I’m sure this was always the case, but getting signed is where the hard work starts. Now there’s someone else’s money at stake, so while I might have less financial risk attached to my musical endeavours, I have more of a moral risk. There’s someone else’s cash and someone else’s time being spent on my music. So it has to be good and it has to do well. That means I put as much effort as I could into my last album and all the promotional activities surrounding it. When I was totally independent I could cut corners, leave promotional activities for a few months, not worry if an album didn’t do as well as it could. That did mean that some releases, particularly Three Rows of Teeth, didn’t quite get the attention I would have liked, either from me or from listeners, but it didn’t matter. And while there are people at the label doing some things, notably PR, planning and lots of the technical stuff, that doesn’t mean I have less to do. It means that when I do find time for music, I can focus on what matters. More is getting done, but I’m still doing as much as I was. There are musicians (hopefully they’re a minority) who complain. There’s no support from labels, people don’t buy music, people don’t come to gigs, piracy and/or streaming are stealing from me. Some of these grievances have merit, but more people are listening to more music than ever before and making it is easier than it’s ever been. All the tools are there and if you want to make it work you can. Providing your aims are making music. If your aims are something tangential to making music like getting rich, please go away. You’re not helping real musicians and there are better ways of getting rich. Being totally independent is more of an option now that it ever was. But if you can find a good label to work with, then you should. It can give you a legitimacy and purpose that is hard to find on your own, and it shares some of the work and some of the risk. Just don’t expect helicopters and huge advances. You won’t get them, and you don’t really want them. So there goes 2015. It was a good year. Musically the last twelve months have contained some real triumphs for me. Yes, this year I became a signed artist. That doesn’t mean what it did a few decades ago. There’s no big recording advance to spend on cocaine (I have to buy my own), no massive media machine or marketing juggernaut to get my music in front of the masses. Just as importantly, there’s no chance of ending up hideously in debt or being told to compromise on my creative decisions. BEM is the very epitome of cottage industry, run by a wonderful team of dedicated nutters who do it for love not profit. Because there aren’t any profits. Also, they all live in a cottage. What difference does this really make for me as an artist? It means certain things aren’t my job any more. I don’t need to book the CD manufacturer, or sort out mastering, or taken on quite as much of the PR and telling people about my music as I did when I was on my own. Just as importantly, it gives me a bit of moral support and validation for what I’m doing. It lends a legitimacy to my work that I didn’t quite feel as a one-man-band. So ta BEM, it’s appreciated. They’re having a January sale. Here’s a link. My fourth album is my best yet. All right, I might be biased, but it really is. Fit the Fourth rounds off a musical journey begun five years ago when Seven Bells John first started haunting my songs. Of the 55 minutes of music on the album, 30 of them are about Seven Bells and his final comeuppance, culminated with Seven Bells Redeemed, a song I’m incredibly proud of. Add to that three other nonsense tracks with some of my most difficult, silliest music to date and you have what I will regard as my masterpiece until I get the next album finished. At which point I’ll think that is best and forget everything I’ve done before. It’s 6 years that I’ve spent working on these silly steampunk songs. Over the next 6 months of so I’ll finally round off that chapter of my work, but for now this is my latest and my best album. Thanks to all those who’ve listened to it and enjoyed it. I played some really fun gigs this year. I don’t often get the time to organise live work, so most gigs I play are ones that are offered to me. Nevertheless, I booked one gig myself and was asked to play a further 6 in 2015. I got to more areas of the country and played to some of the largest (and smallest! ), most engaged, and most indifferent audiences of my career to date. In 2016 I’m playing The Yellow Rooms Brighton on Jan 23rd (EDIT now postponed!) a BEM showcase on Feb 13th in London (tickets here), and Eppyfest (tickets not on sale yet). There should be more gigs in the works too, I’ll let you know when they’re booked. As I’ve said before, the best way to get me gigging in your part of the world is to ask. We need a room and some people to listen, and means to make sure I don’t lose any money. It’s dead simple! …It’s been a good year. What’s next? This year there will be some tidied up re-releases with extra tracks this side of summer and a brand new album the other side of summer. I’ll have a few more other projects on the go as well, many of which should come to fruition in 2016. As I’m often at pains to point out, I don’t make this music for a living, I make it because if I didn’t, I wouldn’t get to listen to the music I want to hear. The fact that a few people besides me like it is amazing. Thanks for listening. More music soon. The latest episode of my Sunday Bootleg podcast ‘Lee Valley Temporal Anomaly’ is available here. You need to listen to Mothertongue! One of the recent signings to Bad Elephant is Mothertongue. They have a website and facebook page too. They are ace. David Bowie has a long history of picking great collaborators. Eno, Fripp, Belew, Alomar, to name but a few. I’m really looking forward to the new Blackstar album and to get myself in the mood I’ve been listening to Ben Minded who plays guitar on it. He’s fabulous. Have a listen to this, or to the Flux album on Spotify. Bad Elephant music is having a January sale. This includes my latest album Fit the Fourth, which you can now get for a fiver (or £2 to download). The perfect opportunity to fill gaps in your BEM collection, or perhaps try something new? Thank you for all your support in 2015, and we look forward to bringing you even more great music next year!